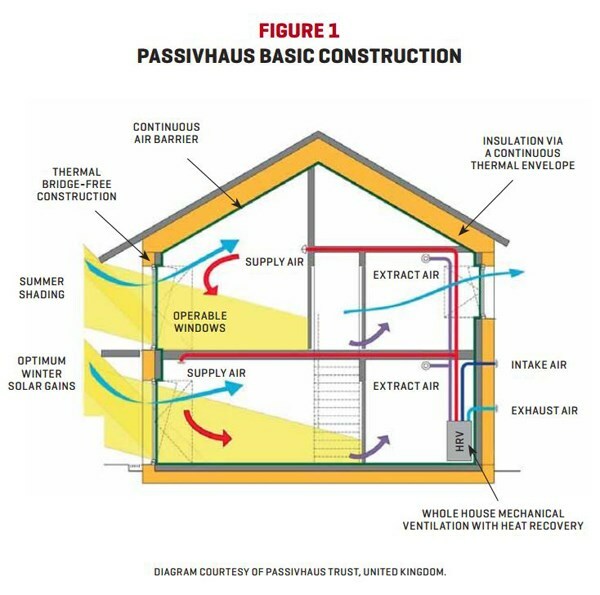 Why is a Passive House Good For My Family? This page presents many of the wellness and sustainability features at Ellis Passivhaus. These start with the building envelope itself, namely thermal-bridge-free and airtight construction of the foundation, roof and wall assemblies - the structure. Then both the interior and exterior surfaces are enveloped with insulation. Together. this minimizes air leaks and keeps the energy inside. Next, a continuous stream of fresh filtered air is delivered while a continuous stream of of stale air is extracted. To this end Ellis Passivhaus incorporates a Zehnder ERV (energy recovery ventilator) which filters out 90% of particulate matter > 1.0 microns and 75% of particulate matter < 1.0 microns while recovering ~ 84% of the energy embedded in the stale air extract stream. But for a small percentage of exterior surfaces, foam insulation has been minimized and used largely around window and door openings. Roxul stone wool and densepack cellulose fill all interior cavities. Interior finishes include Certainteed AirRenew Drywall and Crossville Hydrotect porcelain tile both of which render VOCs inert. No VOC paints and finishes have been used exclusively. All rights reserved | Copyright 2018 | Kenwood Construction Services, Inc.